Sometimes espresso is too fresh to use. But there are times when I need to pull shots sooner than expected. I usually wait several days after roasting before testing my espresso, but since we we’re sold out on whole bean espresso, I needed to test a couple days earlier than usual. At altitude espresso acts differently than at a lower elevation. What might be good at three to five days rest near the coast might need closer to seven days at altitude. So testing at less than 48 hours here involves some forecasting and manipulation. I grind on the ultrafine end of espressodom, and knowing my components, I say 17 grams. Now keep in mind I’m just looking for tasting notes, not perfection at this point. I pull the first shot and the crema is outrageously wild. I tighten the grind a little more. The crema is manageable and the aromatics are off the charts. Smell. Sip. Pause while my brain runs through my limited tasting vocabulary. Sip. 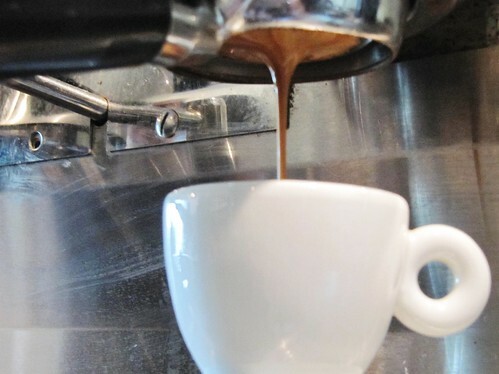 Develop a mental tasting picture of the espresso. Finish. Ponder. Name it. Write it. Bag it. This jazzy cacophony of flavors will leave you shouting joyously to the open ears of frantic handless pantomimes. This three bean blend brings coffees from Sumatra Mandheling, Ethiopia Guji Quto Suke and a wonderful coffee from San Martin de Leon Cortes. In the cup it’s rhythmic raspberry and stone fruit with a punctuated praline-toffee sweetness. Recommend: 198.5 – 199F, 17g, 28 S.
And it tastes exactly like it sounds.